Alessandro Tassoni is best remembered for his mock-heroic satiric poem La secchia rapita (1621), which introduced a new genre of literature to Italy that mixed comic and serious elements. He also, however, penned several prose works including this seminal attack on Petrarch and his followers. The copy recently acquired by Special Collections is from the first edition of 1609. The text is original to Tassoni, full of quips, digressions, and literary comparisons. Its printing ignited a flurry of literary controversy, most directly with Giuseppe degli Aromatari who published a defense of Petrarch titled Risposte (1611). A copy of Tassoni’s subsequent response, Avvertimenti di Crescentio Pepe da Susa al Sig. Giosefo de gli Aromatari alle Risposte date da lui alle Considerazioni del Sig. 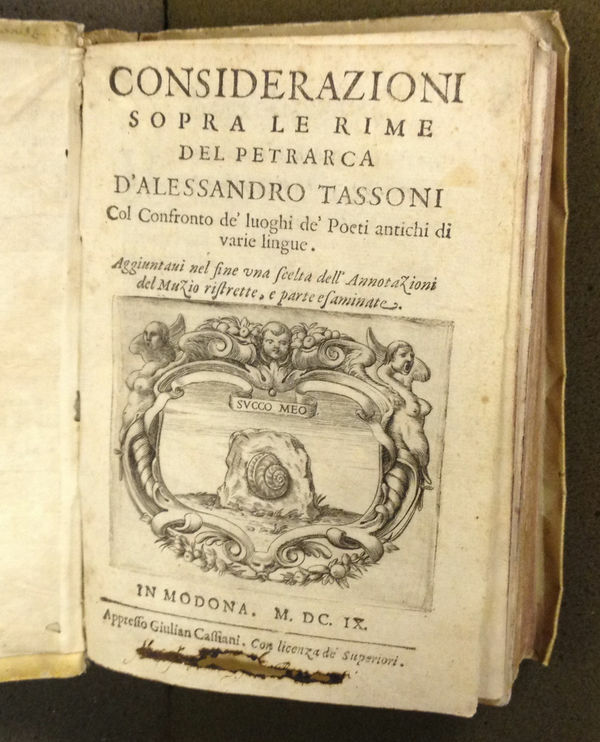 Alessandro Tassoni sopra le Rime del Petrarca (1611), has also recently been purchased and is available for use within Special Collections. Originally published by Tracy Bergstrom at italianstudies.nd.edu on October 06, 2014.